to prepare pastes and sauces. 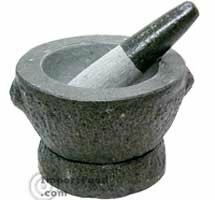 They are also used for grinding herbs and spices. 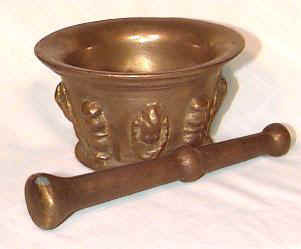 then pounded with a stone, the pestle. 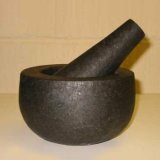 The tip of the pestle is unpolished making it perfect for effectively crushing or grinding spices and herbs. 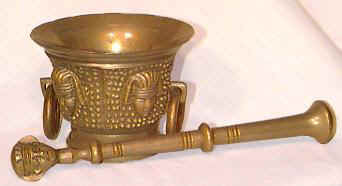 Guacamole and Pesto are often made in large mortars. 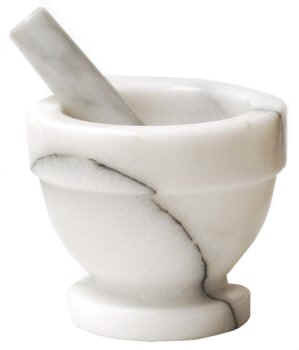 I keep this item sitting out on the counter to use for grinding oregano, basil or rosemary. I also use it for grinding peppercorns. You can make herbal salts by adding your favorite herbs to sea salt. Authentic Mexican Volcanic Rock "Molcajete"
one you can get one by mail order by calling 212-570-0300. To season the Molcajete, grind a handful of rice and then rinse it out. can coat with olive oil to help seal the surface. Then, wash after each use.